For other uses, see Don River (disambiguation). The Don (Russian: Дон, IPA: [don]) is one of the major Eurasian rivers of Russia and the fifth-longest river in Europe. The Don basin is between the Dnieper basin to the west, the Volga basin to the east, and the Oka basin (tributary of the Volga) to the north. The Don rises in the town of Novomoskovsk 60 kilometres (37 mi) southeast of Tula (120 km south of Moscow), and flows for a distance of about 1,870 kilometres to the Sea of Azov. From its source, the river first flows southeast to Voronezh, then southwest to its mouth. The main city on the river is Rostov on Don. Its main tributary is the Seversky Donets. In antiquity, the river was viewed as the border between Europe and Asia by some ancient Greek geographers. In the Book of Jubilees, it is mentioned as being part of the border, beginning with its easternmost point up to its mouth, between the allotments of sons of Noah, that of Japheth to the north and that of Shem to the south. During the times of the old Scythians it was known in Greek as the Tanaïs (Τάναϊς) and has been a major trading route ever since. Tanais appears in ancient Greek sources as both the name of the river and of a city on it, situated in the Maeotian marshes. Pliny gives the Scythian name of the Tanais as Silys. According to Plutarch, the Don River was also home to the legendary Amazons of Greek mythology. The area around the estuary is speculated to be the source of the Black Death. While the lower Don was well known to ancient geographers, its middle and upper reaches were not mapped with any accuracy before the gradual conquest of the area by Muscovy in the 16th century. The Don Cossacks, who settled the fertile valley of the river in the 16th and 17th centuries, were named after the river. The fort of Donkov was founded by the princes of Ryazan in the late 14th century. The fort stood on the left bank of the Don, about 34 kilometers (21 mi) from the modern town of Dankov, until 1568, when it was destroyed by the Crimean Tatars, but soon restored at a better fortified location. It is shown as Donko in Mercator's Atlas (1596), Donkov was again relocated in 1618, appearing as Donkagorod in Joan Blaeu's map of 1645. Both Blaeu and Mercator follow the 16th-century cartographic tradition of letting the Don originate in a great lake, labelled Resanskoy ozera by Blaeu. Mercator still follows Giacomo Gastaldo (1551) in showing a waterway connecting this lake (by Gastaldo labelled Ioanis Lago, by Mercator Odoium lac. Iwanowo et Jeztoro) to Ryazan and the Oka River. Mercator shows Mtsensk (Msczene) as a great city on this waterway, suggesting a system of canals connecting the Don with the Zusha (Schat) and Upa (Uppa) centered on a settlement Odoium, reported as Odoium lacum (Juanow ozero) in the map made by Baron Augustin von Mayerberg, leader of an embassy to Muscovy in 1661. In modern literature, the Don region was featured in the work And Quiet Flows the Don by Mikhail Aleksandrovich Sholokhov, a Nobel-prize winning writer from the stanitsa of Veshenskaya. At its easternmost point, the Don comes near the Volga, and the Volga-Don Canal (length ca. 105 kilometres (65 mi)), connecting the two rivers, is a major waterway. The water level of the Don in this area is raised by the Tsimlyansk Dam, forming the Tsimlyansk Reservoir. For the next 130 kilometres (81 mi) below the Tsimlyansk Dam, the sufficient water depth in the Don River is maintained by the sequence of three dam-and-ship-lock complexes: the Nikolayevsky Ship Lock (Николаевский гидроузел), Konstantinovsk Ship Lock (Константиновский гидроузел), and the best known of the three, the Kochetovsky Ship Lock (Кочетовский гидроузел). The Kochetovsky Lock, built in 1914–1919 and doubled in 2004–2008, is 7.5 kilometres (4.7 mi) below the fall of the Seversky Donets into the Don, and 131 kilometres (81 mi) upstream of Rostov-on-Don, the Kochetovsky Ship Lock (Кочетовский гидроузел) (47°34′07″N 40°51′10″E﻿ / ﻿47.56861°N 40.85278°E﻿ / 47.56861; 40.85278) is located. This facility, with its dam, maintains sufficient water level both in its section of the Don and in the lowermost stretch of the Seversky Donets. This is presently the last lock on the Don; below Kochetovsky lock, the sufficient depth of the navigation waterway is maintained by dredging. In order to improve shipping conditions in the lower reaches of the Don, the waterway authorities support the proposals for the construction of one or two more low dams with locks, in Bagayevsky District and possibly also in Aksaysky District. ^ Norman Davies (1997). Europe: A History. p. 8. ISBN 0-7126-6633-8. ^ e.g. Strabo, Geographica, 11.2.2. ^ Ole J. Benedictow. "The Black Death: The Greatest Catastrophe Ever". www.historytoday.com. ^ Taurica Chresonesus, Nostra aetate Przecopsca et Gazara dicitur in Atlas sive Cosmographicae Meditationes de Fabrica Mundi et Fabricati Fugura (1596). ^ Studia językoznawcze: streszczenia prac doktorskich, Zakład Narodowy im. Ossolinśkich, 1976, p. 108. ^ Litus, Ludmilla L. "Mikhail Aleksandrovich Sholokhov (11 May 1905-21 February 1984)." Russian Prose Writers Between the World Wars, edited by Christine Rydel, vol. 272, Gale, 2003, pp. 383-408. Dictionary of Literary Biography Vol. 272. Dictionary of Literary Biography Main Series, http://link.galegroup.com/apps/doc/TCDGXR460831919/DLBC?u=duke_perkins&sid=DLBC. Accessed 1 Feb. 2018. Wikimedia Commons has media related to Don River. The River of Cuyari, called by the Portuguese Madeira or the Wood River, is formed by two great rivers, which join near its mouth. It was by this River, that the Nation of Topinambes passed into the River Amazon. The Volga is the longest river in Europe with a catchment area of 1,350,000 square kilometres. It is also Europe's largest river in terms of discharge and drainage basin. The river flows through central Russia and into the Caspian Sea, and is widely regarded as the national river of Russia. The Sea of Azov is a sea in Eastern Europe. To the south it is linked by the narrow Strait of Kerch to the Black Sea, and it is sometimes regarded as a northern extension of the Black Sea. The sea is bounded in the northwest by Ukraine, in the southeast by Russia. The Don and Kuban are the major rivers that flow into it. The Sea of Azov is the shallowest sea in the world, with the depth varying between 0.9 and 14 metres. There is a constant outflow of water from the Sea of Azov to the Black Sea. 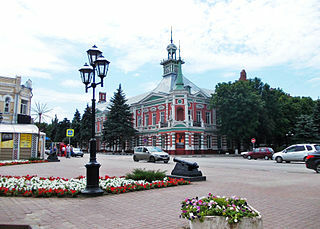 Rostov-on-Don is a port city and the administrative centre of Rostov Oblast and the Southern Federal District of Russia. It lies in the southeastern part of the East European Plain on the Don River, 32 kilometers (20 mi) from the Sea of Azov. The southwestern suburbs of the city abut the Don River delta. The population is over one million people (1,125,000). The Kuban River is a river in the Northwest Caucasus region of European Russia. It flows mostly through Krasnodar Krai for 660 kilometres (410 mi) but also in the Karachay–Cherkess Republic, Stavropol Krai and the Republic of Adygea. 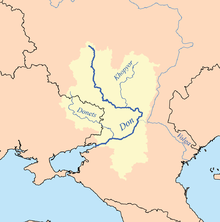 The Seversky Donets, Siverskyi Donets, usually simply called the Donets, is a river on the south of the East European Plain. It originates in the Central Russian Upland, north of Belgorod, flows south-east through Ukraine and then again through Russia to join the Don River, about 100 km (62 mi) from the Sea of Azov. The Donets is the fourth longest river in Ukraine and the biggest in the Eastern Ukraine. It is an important source of fresh water in the east of the country. It gives its name to the Donets Basin, known commonly as the Donbass, an important coal mining region in Ukraine. The Svir is a river in Podporozhsky, Lodeynopolsky, and Volkhovsky districts in the north-east of Leningrad Oblast, Russia. It flows westwards from Lake Onega to Lake Ladoga, thus connecting the two largest lakes of Europe. It is the largest river flowing into Lake Ladoga. The length of the Svir is 224 kilometres (139 mi), whereas the area of its drainage basin is 84,400 square kilometres (32,600 sq mi). The towns of Podporozhye and Lodeynoye Pole, as well as urban-type settlements Voznesenye, Nikolsky, Vazhiny, and Svirstroy are located at the banks of the Svir. Mius is a river in Eastern Europe that flows through Ukraine and Russia. The Moscow Canal, named the Moskva-Volga Canal until 1947, is a canal that connects the Moskva River with the Volga River. It is located in Moscow itself and in the Moscow Oblast. The canal connects to the Moskva River in Tushino, from which it runs approximately north to meet the Volga River in the town of Dubna, just upstream of the dam of the Ivankovo Reservoir. The length of the canal is 128 km. Taganrog Bay or Tahanrih Bay is the northeastern arm of the Sea of Azov. It also may be perceived as a flooded estuary of the Don River. The Volga–Baltic Waterway, formerly known as the Mariinsk Canal System, is a series of canals and rivers in Russia which link the Volga River with the Baltic Sea via the Neva River. Volga–Baltic Waterway connects the biggest lake on Earth, the Caspian Sea to the World Ocean. Its overall length between Cherepovets and Lake Onega is 368 kilometres (229 mi). Oskol or Oskil is a south-flowing river in Russia and Ukraine. It arises roughly between Kursk and Voronezh and flows south to join the Seversky Donets which flows southeast to join the Don. It is 436 kilometres (271 mi) long, with a drainage basin of 14,680 square kilometres (5,670 sq mi). The Eurasia Canal is a proposed 700-kilometre-long (430 mi) canal connecting the Caspian Sea to the Black Sea along the Kuma-Manych Depression. Currently, a chain of lakes and reservoirs and the shallow irrigation Kuma-Manych Canal are found along this route. 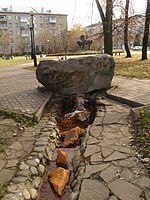 Nezhegol is a river in Belgorod Oblast in Russia. It is a left tributary of the Seversky Donets. It is 75 kilometres (47 mi) long, with a drainage basin of 2,878 square kilometres (1,111 sq mi). The average discharge is 8.3 m³/sek.